The lifeblood of every independent healthcare practice is its referral base. After co-founding a private practice and working with many other healthcare practitioners over the last ten years. One common issue to everyone is that we can all use more referrals. But one barrier that is often preventing us from getting new referrals is that there is what I call a knowledge gap between what you know as the practitioner, and where the potential referring practitioner understands with regards to the awareness of how your services can help them and their patients. So, said another way, we can’t assume our referral base knows how to best refer and use our services. So how do we overcome this block? Well, one way to do this is to educate our referral base with simple 1 or 2-page case studies. So at our center, what we do is take all the different aspects of your service and build a simple case study around each of them to demonstrate how a referring practitioner might use your service for their patients. We want to educate, not advertise our services, and we want to make it all about them and how it can help their patients. So if you’re a physiotherapist or chiropractor, maybe you offer services that help with lower back pain… by creating a simple case study about how you’ve helped patients with lower back pain and demonstrate when a referring practitioner might refer this type of patient too you is a great start. Another example is at our ultrasound center, a lot of practitioners thought we only offered pregnancy ultrasounds, which is a common use of ultrasound but once we educated them on all the different aspects of how ultrasound can help their other patients, our referrals went way up. So, what we did was, we took all the different services that can be provided by ultrasound in my case, and created simple case studies that showed a family doctor what to look out for in a patient that might need a specific type of ultrasound. For example, we’d help show them when is the optimal time to refer for a pelvic ultrasound or what to do when a patient presents to them with abdominal pain, etc. So these are written educational pieces with supporting images if needed, that build trust and at the end of each case study we simple offer a few sentences about our services and that’s it… no heavy advertising, just merely looking to help and build some trust. So once you have your case study created, how do you get it into the hands of your potential new referrers? We use fax, snail mail, email, post on our blog, LinkedIn and Facebook to distribute the case study as far and wide as possible. 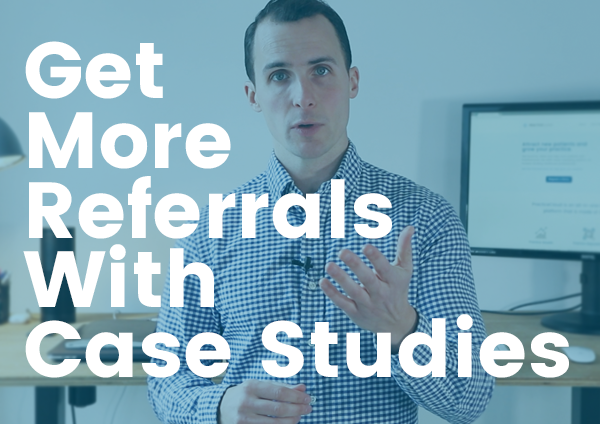 I’ll create another video around how to build up your list and referral network but for now, give the case study approach a shot and let me know how it goes. If you have any questions or comment about how to create an effective case study comment below, we are always happy to help. And if you are looking to grow your practice, visit PracticeCloud.com, the growth platform for independent healthcare professionals. We make it easy for patients and new referral sources to find you, make appointments with you and stay connected with you.